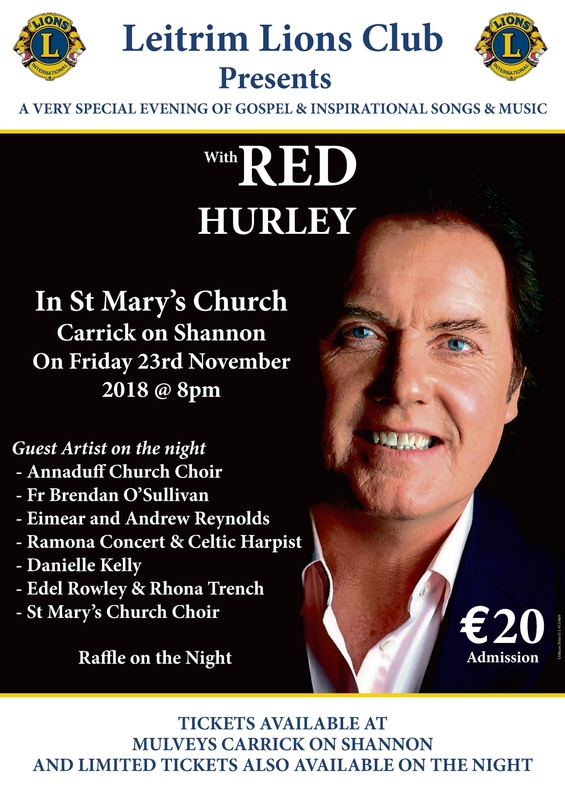 Red Hurley will perform inspirational songs in St. Mary's Church, Carrick-on-Shannon this Friday. Leitrim Lions Club present a very special treat with the renowned Irish singer Red Hurley live in concert in St. Mary's Church, Carrick-on-Shannon this Friday, November 23 at 8pm. Red will be performing at a very special evening of Gospel and inspirational songs and music and will be joined by Annaduff Church Choir, Fr. Brendan O'Sullivan, Eimear and Andrew Reynolds from Rooskey, the renowned Concert and Celtic Harpist Ramona, Danielle Kelly, Edel Rowley and Rhona Trench, and St. Mary's Church Choir. There will be a raffle on the night with fabulous spot prizes of meals in local hotels and restaurants. Tickets for this special night of music and song are just €20 and are available from Mulvey's House of Gifts, Carrick-on-Shannon with limited availability on the night.